Stop Puppy Biting, the Best Way! Hand feeding is essential in developing a soft mouth. As a Professional Dog Trainer, it is my job to teach you how to teach your puppy or rescue dog to have a soft mouth. This goes for your puppy mouthing a human, child or another dog. If you have adopted a rescue dog, can you be assured this dog knows not to bite? I discuss a soft mouth in all my classes because it is so important and many of you have rescued a dog. If I approach your tethered dog holding a scarf, glove or toy, will your dog lunge and grab the item along with my hand? Have you tried yelling, “no!” Did yelling teach your dog an appropriate behavior? Instead of yelling, you can simply walk away the second the feet come off the floor. Approach the dog again, if his behavior is not appropriate, walk away, repeat until he sits or does not jump, then reward with play! 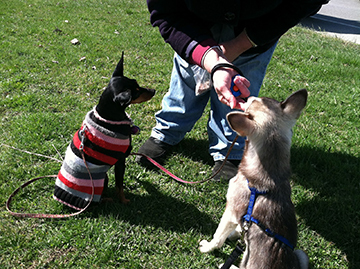 Rewarding your dog for the appropriate behavior is much faster than telling the dog “no”. It is essential that your dog associates all hands with complete trust. I say this because if your reprimand towards your puppy is too harsh, for example, holding the pups mouth closed with your hands, or sticking your fingers down its throat, or holding your dog down for biting too hard, you can actually teach your puppy to bite others, just not you. Dog Star Daily has a wonderful article on Puppy Biting, please read below. For the best way to teach your dog a soft mouth, read more…. 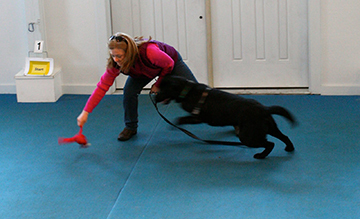 Management, as it relates to dog training keeps everyone safe. 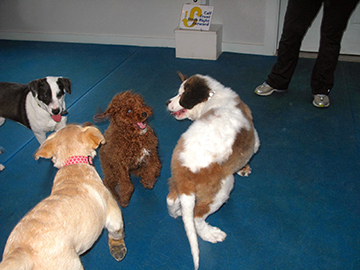 Management, does not teach your dog a behavior, in fact it often creates frustration and increases arousal. Using forms of management are useful when you need to prevent conflict, such as putting your dog in the bedroom when guests come over. Using effective management tools, often buy’s you some time, as you teach and reward an alternative behavior. I will fade the food lure quickly and simply reward when he offers a sit. For example: A leash is a management tool used to prevent a dog from jumping on someone. In this photo, Gambits leash is a form of management, however I am luring this handsome 5 month old pup into a sit and rewarding him. With some repetition, a person approaching becomes the cue for Gambit to sit if he wants affection or food wether he has a leash on or not. Another example: Grabbing your dogs collar when people enter the doorway is a form of management to prevent him from jumping or running out the door. However, if you teach him an alternative behavior like a sit/stay then you will no longer have to manage. One more: Using a crate to potty train your puppy is a form of management that keeps the puppy safe and prevents him from practicing the unwanted behavior of peeing on the floor. Immediately rewarding your puppy with a piece of dried liver after each of the 6 or so times he pees in the grass will certainly be reinforcing, so he will repeat the correct behavior to get the same yummy reward! 3 of these pups are under 1 yr and learning to stay. In Summary: If your dog seems overly aroused, barks often, chases anything that moves, is displaying frustration or poor impulse control behavior, is it possible you are simply frustrating your dog through the over use of managment? Consider teaching him what to do in each situation and reward him with anything he loves to reinforce positive behavior. This will make you a proud parent and keep him from getting frustrated, all while building a better relationship! 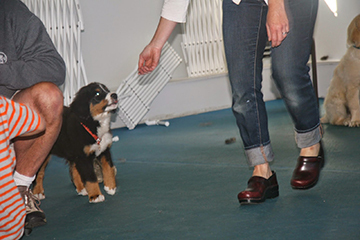 One Behavior You Must Teach Your Puppy? To Sit? That is a nice default behavior, but not the most important one to teach. To Come? Great behavior to have consistently for sure! To Leave it? Awesome behavior to have, great on walks both on and off leash! Hand feeding for good behavior. How about not to bite human flesh? Sounds pretty important to me! Bite inhibition is the technical term for a dogs ability to control the pressure they use when biting. If you could only teach your puppy or new rescue dog one behavior, please remember to teach him a soft mouth — aka bite inhibition. How? By giving your dog appropriate feedback. Over several days with the following positive techniques, your puppy will learn this life saving skill. 1. Hand feeding daily meals, release the food when your puppy is gentle or licks. If you feel teeth, wait until he softens, then reward. Example: Say your pups name and when he look at you, offer a piece of food. Say your pups name and “come” offer a piece of food as a reward. Reward your puppy for coming and sitting 10 times per meal and you will have a solid sit and a softer mouth! Playing Tug can teach a soft mouth. exchange with the food while putting the toy behind your back. Repeat, sit, take it, tug, leave it. Flat pan cake hands are non threatening. 3. Body handling your puppy with a soft, flat gentle hand. If your puppy bites your hand, then let your hand go limp, dead like, and wait until the puppy removes his mouth from your hand. Repeat slowly and gently as your pup learns that hands predict good gentle scratches and massaging. Some puppies respond if you scream, but some thing you are simply playing, so this feedback may help and it may not as all puppies are different. not to bite too hard, many pups learn to use a soft mouth when playing with their mother, however some pups miss out on this lesson and will therefore learn it while playing with other puppies and of course playing with you. Teaching your puppy a soft mouth or good bite inhibition is the ONE most important behavior you need to teach. Remember, your pup will not stop using his mouth on you and your clothes in 1 day as he has been using it with his siblings for 8 weeks, be patient and give your puppy the feedback he so needs to be able to live with humans. What should you not do? Scare your puppy or teach him that human hands are to be feared, as this tactic will most likely make him want to bite hands more. Why? Science has taught us that dogs who are handled in a physical or rough manner are more often to bite later in life. Science has also taught us that aggression breeds more aggression. If you do not want your puppy to use his mouth to resolve conflict, then please do not use your hands to resolve conflict. Science has taught us that rough hands on a pup, will create unwanted behavior changes as the pup matures. Example: Submissive peeing, over the top wiggly greetings, worse mouthy behavior, biting later as an adolescent dog, growly and avoidance behaviors. Dr. Sophia Yin, Low Stress Handling. Although Sophia passed away just yesterday, she will always be a source to reference because she educated those of us in the Pet Industry that the emotional well being of the animal is essential to avoiding unwanted behavior changes. I am often called to a home where a dog has nipped or bitten a child. Parents often admit they have punished the dog for growling in the past. Not all our dogs have grown up with children and some are worried. When there is a language barrier between two species, communication is often misunderstood and conflict can easily follow. 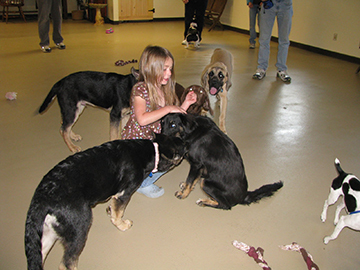 Socializing pups with calm children is essential to prevent a dog bite. A three year old running at a dog with an object in his hand can be scary. How many times does your dog have to get up and move away to keep himself out of trouble before someone slows down the noisy moving child? If by noon, the dog has looked away three times, offered a few tongue flicks, turned his head away five times and gotten up from his resting place four times to avoid conflict with the little tornado, then on the twelth time he may give a growl. I can not tell you how tolerant a dog should be, but I can tell you that they all have a threshold or a breaking point just like we humans do. I hope you recognize the growl as a low level warning that your dog is asking for space, and please do NOT punish the warning growl. In the future, I guarantee you would prefer your dog growl as a distance cue rather than use his teeth! What other pet animal is so tolerant of children? Bunnies will squeak a warning and nip, cats will hiss and claw out, hamsters have also learned that nipping gets them safely back in their cage. I am happy to report that many moms have asked me to speak to their children as a way to educate the child on how the dog is “feeling” when they are near. While some dogs enjoy having kids around, clearly others do not. 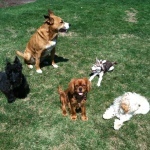 Our responsibility is to step in and help our dogs feel safe so they do not have to resolve the conflict alone. I like this child, she is not moving and she feeds me! If you live or work with children, it is especially helpful for you to know your dogs signals that he or she may be feeling worried. That way you can intervene so that your dog never has to growl or nip, or reach his or her threshold point. I am certain that the dogs in the above photo, who are being fed by the young girl in the stroller, are feeling pretty good being fed by a child that is not running around. However, if she were to get out of the stroller and run at these dogs, they would not feel the same way and one of them would need to be removed to keep him from hitting his threshold. 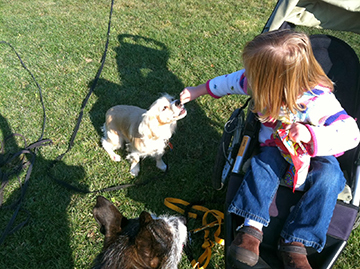 With lots of positive associations and yummy treats, both these dogs can learn to enjoy children running around them. So please, if you observe a dog feeling worried about a child moving nearby, remove either the child or the dog so that the dog is feeling safe and the dog does not get into trouble. An ounce of knowledge can go along way to helping both dogs and children grow up together in a positive way. I am very proud to announce my hard work and continued education has earned me the title ofAssociate Certified Dog Behavior Consultant- ACDBC. I am the only ACDBC south of Bangor, and the only one in Portland, Maine. My desire to better understand dog behavior and behavior problems is on going and I will continue to study and learn to better help my clients. For help in setting you and your dog up for success, I certainly recommend a Certified positive reinforcement trainer. 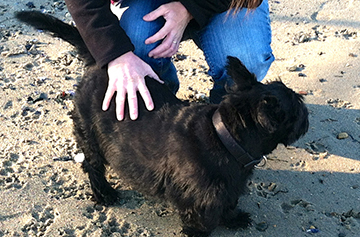 Sophie, my scottie is clearly concerned about the presence of this stranger near her. Her eye is on him, her tail is up, she is standing rigid and not moving. I quickly asked him to stand still until I could reengage her in her ball. As this worker moved about the house, I used play to desensitize her to his presence. This Counter Conditioning process involves taking a fear provoking stimulus (stranger) and changing the association to one of signaling something (pleasant) in this case, a play session. I began this process over 1 year ago with children and strangers on my street and in my yard, by using yummy treats or play to counter condition Sophie’s emotional response when strangers were present. This generalization stage is the phase of learning where the dog learns that the new association is relevant in a variety of circumstances and situations. Sophie now enjoys strangers entering our home as she associates them with something positive, but having this stranger disappear and reappear with no warning from inside is something very unsettling for her. I am sure once I get this situation comfortable for Sophie, she will again alert me to something new with a guest or stranger that she is not comfortable with. I believe I will always need a maintenance stage in which I incorporate repetitions from previous training stages to encourage the appropriate emotional response from her. While many dogs can be counter conditioned quicker, I adopted Sophie at age 5, so her behaviors had been practiced for some time, but her progress is steady and improving with each play session!